In Part 1 of this two-part article on pushing data to a Silverlight client with a WCF polling duplex service, I demonstrated how service contracts and operations can be defined on the server. WCF has built-in support for duplex communication (two-way communication between a service and a client) but does require a reference to System.ServiceModel.PollingDuplex.dll to make it work with Silverlight. This assembly is provided in the Silverlight SDK and is currently in "evaluation" mode (the Silverlight go-live license doesn't apply to it). With the polling duplex model the Silverlight client does poll the service to check if any messages are queued so it's not as "pure" as the sockets option available in Silverlight when it comes to pushing data from a server to a client. However, it offers much greater flexibility when compared to sockets since it isn't limited to a specific port range and works over HTTP. Let's take a look at how a Silverlight client can send and receive messages from a polling duplex WCF service and what types of messages are sent between the two. An example of using the WCF Message type in a WCF service is shown next. Details about this code were covered in Part I. Reference System.ServiceModel.dll and System.ServiceModel.PollingDuplex.dll in your Silverlight project. Additional details on where to find the System.ServiceModel.PollingDuplex.dll assembly used by Silverlight can be found here. Import the System.ServiceModel and System.ServiceModel.Channels namespaces. Create a PollingDuplexHttpBinding object instance and set the PollTimeout and InactivityTimeout properties (both were discussed in Part 1). Use the PollingDuplexHttpBinding object to build a channel factory. Open the channel factory and define an asynchronous callback method that is called when the open completes. Use the factory class to create a channel that points to the service's HTTP endpoint. Open the channel and define an asynchronous callback method that is called when the open completes. Define a callback method that is called when the channel closes. Create a Message object and send it asynchronously to the service using the channel object. Define an asynchronous callback method that is called when the send completes. Start a message receive loop to listen for messages "pushed" from the service and define a callback method that is called when a message is received. Process data pushed by the server and dispatch it to the Silverlight user interface for display. Now that you've seen the fundamental steps, let's take a look at the code that makes this process work. The following code shows a class named PushDataReceiver that encapsulates the factory and channel classes and handles all of the asynchronous operations that occur. The class allows an object of type IProcessor to be passed into it along with a service URL, service action and initial data to send to the service (if any). The IProcessor object represents the actual Silverlight Page class used to update data on the user interface in this case. As data is received the Page class's ProcessData() method will be called. // The factory is now open. Create and open a channel from the channel factory. // Start listening for callbacks. // Show the service response in the UI. When the PushDataReceiver class's Start() method is called by Silverlight it creates a channel factory instance which is used to create a channel instance. The CompleteOpenChannel() callback method shown previously then sends an initial message to the service endpoint and encapsulates the data to be sent in a WCF Message object. The message data is then sent along with the proper service action to call on the server. After the initial message is sent a receive loop is started (see the ReceiveLoop() method) which listens for any messages sent from the server to the client and processes them accordingly. Once a message is received the CompleteReceive() method is called and the message data is routed back to the Silverlight Page class. The PushDataReceiver class shown earlier dispatches data received from the server back to the Silverlight Page class for processing. 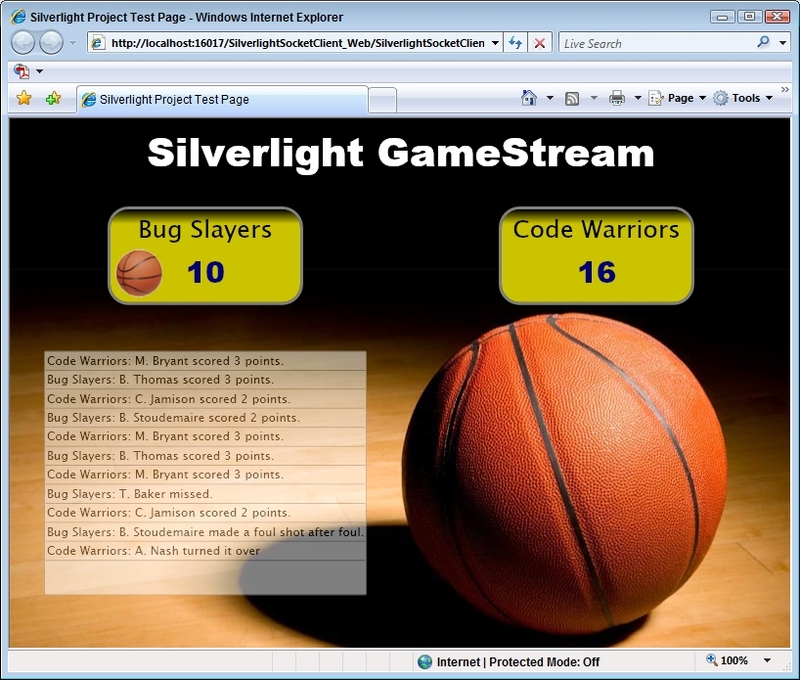 Data sent from the server is in XML format and multiple techniques can be used to process it in Silverlight ranging from the XmlReader class to LINQ to XML functionality to the XmlSerializer class. I chose to use the XmlSerializer class to process the data since it provides a simple way to map XML data to CLR types with a minimal amount of code. Although you can create the CLR classes that XML data maps to by hand, I chose to create an XSD schema and use .NET's xsd.exe tool to generate code from the schema for me. The xsd.exe tool provides a simple way to generate C# or VB.NET code and ensures that the XML data will be successfully mapped to the appropriate CLR type's properties. An example of using the tool is shown next. If you use the xsd.exe tool to generate classes that will be used in a Silverlight client you'll have to remove a few lines that don't compile from the auto-generated code. The xsd.exe tool generates code designed to run on the full version of the .NET framework but with a few minor modifications you can also use the code with Silverlight. Simply remove the namespaces and attributes that the compiler says are invalid from the auto-generated code. Once data is received by the Silverlight client from the WCF polling duplex service it's processed by a method named ProcessData() (the method called by the PushDataReceiver class) in the sample application. ProcessData() uses the XmlSerializer class to deserialize XML data into custom Teams and ScoreData objects (the Teams and ScoreData classes were generated from XSD schemas using the xsd.exe tool mentioned earlier). The complete code for the application including the WCF duplex polling service and the Silverlight client can be downloaded here.